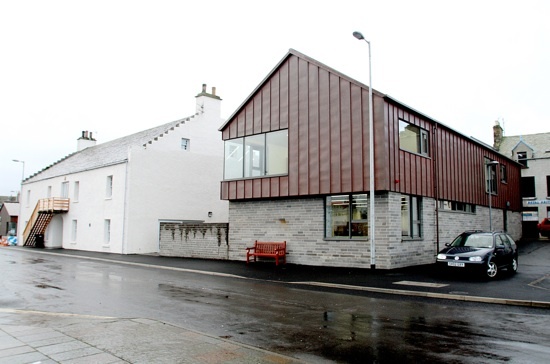 Stromness Library, a branch of the main Orkney Library and Archive, is situated in the Warehouse Buildings, which opened in May 2015. The library had previously occupied the library building at 2 Hellihole Road since 1906. For more information about the history of the library in Stromness please visit the New Chapter website. We have a wide range of fiction and non-fiction titles available for loan as well as audio books, music CDs and a bright, well stocked childrens section. We also have a reference collection, housed upstairs in the George Mackay Brown Room, along with a fascinating collection of old editions of the Orcadian newspaper. In the main library you will find an up-to-date selection of local and national newspapers and magazines covering a wide range of subjects and interests, which you can enjoy in our foyer seating area, or upstairs on our comfy sofas, which offer a fantastic view over Stromness harbour. If the book you want is not available we offer an inter library loan service through which you can borrow books from libraries throughout the country. Free internet access is available via six public access PCs, and by WiFi connection. Following the move to the Warehouse Buildings the library service has joined up with Orkney Islands Council Customer Services, meaning you can access a range of council services at the reception desk, from free dog poo bags to paying your council tax! We also have three meeting rooms with kitchen facilities available to hire for meetings and events. Please get in touch if you would like more information about room hire. Outside of opening hours you can return books to our book-drop box, which is situated in the courtyard on the harbour side of the building.